The class type geometric_distribution represents a geometric distribution: it is used when there are exactly two mutually exclusive outcomes of a Bernoulli trial: these outcomes are labelled "success" and "failure". For Bernoulli trials each with success fraction p, the geometric distribution gives the probability of observing k trials (failures, events, occurrences, or arrivals) before the first success. For this implementation, the set of trials includes zero (unlike another definition where the set of trials starts at one, sometimes named shifted). 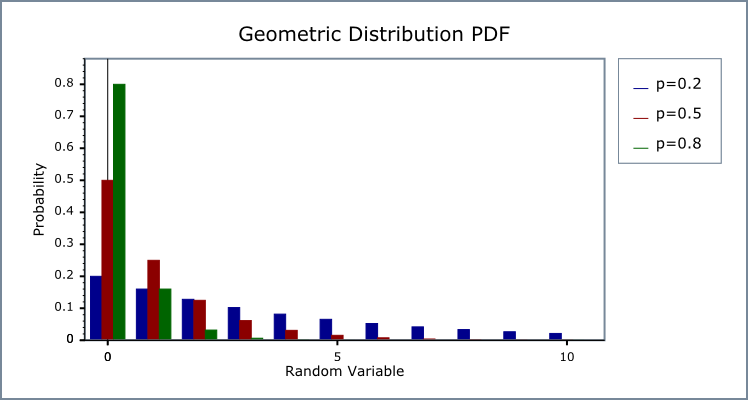 The geometric distribution assumes that success_fraction p is fixed for all k trials. For example, when throwing a 6-face dice the success probability p = 1/6 = 0.1666 ̇ . Throwing repeatedly until a three appears, the probability distribution of the number of times not-a-three is thrown is geometric. This implementation uses real numbers for the computation throughout (because it uses the real-valued power and exponential functions). 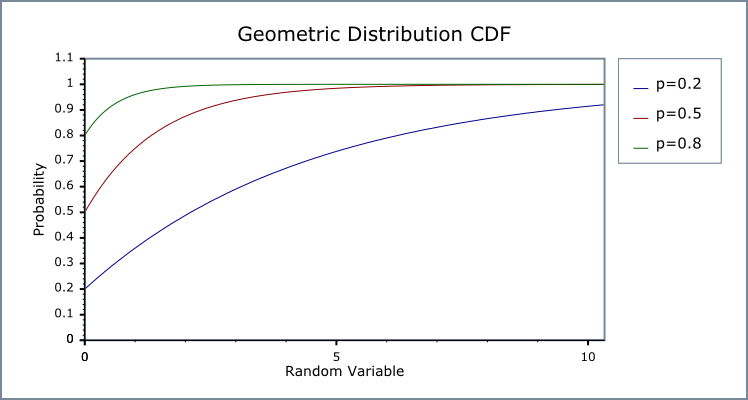 So to obtain a conventional strictly-discrete geometric distribution you must ensure that an integer value is provided for the number of trials (random variable) k, and take integer values (floor or ceil functions) from functions that return a number of successes. 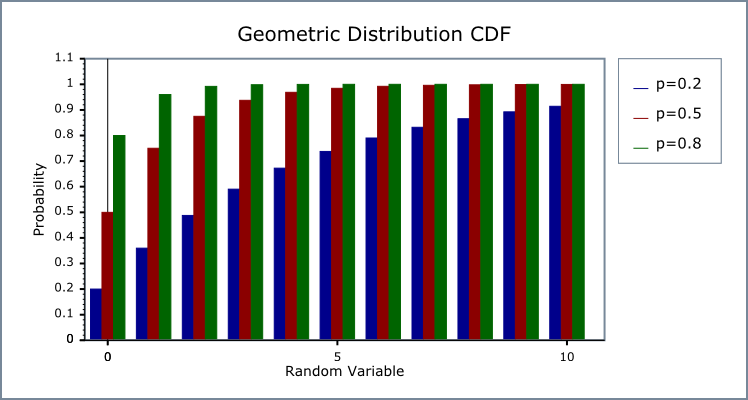 The geometric distribution is a discrete distribution: internally, functions like the cdf and pdf are treated "as if" they are continuous functions, but in reality the results returned from these functions only have meaning if an integer value is provided for the random variate argument. This behaviour can be changed so that the quantile functions are rounded differently, or even return a real-valued result using Policies. 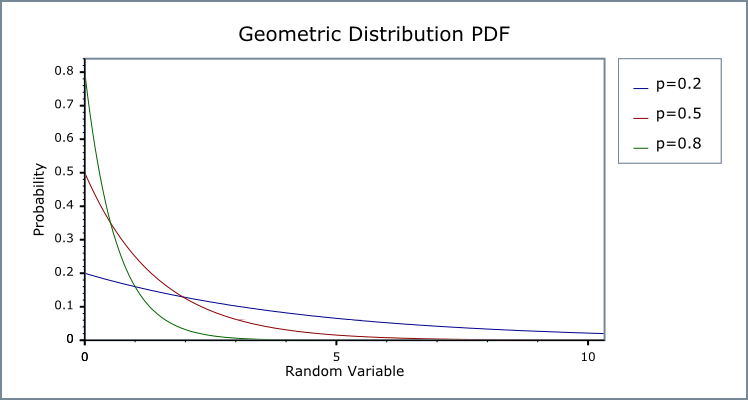 It is strongly recommended that you read the tutorial Understanding Quantiles of Discrete Distributions before using the quantile function on the geometric distribution. The reference docs describe how to change the rounding policy for these distributions. Constructor: p or success_fraction is the probability of success of a single trial. Requires: 0 <= p <= 1. Returns the success_fraction parameter p from which this distribution was constructed. // with successes r == 1. The following functions are equivalent to those provided for the negative binomial, with successes = 1, but are provided here for completeness. The best method of calculation for the following functions is disputed: see Binomial Distribution and Negative Binomial Distribution for more discussion. The total number of failures before the 1st success. See negative_binomial confidence interval example. Returns the smallest number of trials we must conduct to be 95% (1-0.05) sure of seeing 10 failures that occur with frequency one half. This function uses numeric inversion of the geometric distribution to obtain the result: another interpretation of the result is that it finds the number of trials (failures) that will lead to an alpha probability of observing k failures or fewer. This function uses numeric inversion of the geometric distribution to obtain the result: another interpretation of the result, is that it finds the number of trials that will lead to an alpha probability of observing more than k failures. Table 14. Meaning of the non-member accessors. This distribution is implemented using the pow and exp functions, so most results are accurate within a few epsilon for the RealType. For extreme values of double p, for example 0.9999999999, accuracy can fall significantly, for example to 10 decimal digits (from 16). In the following table, p is the probability that any one trial will be successful (the success fraction), k is the number of failures, p is the probability and q = 1-p, x is the given probability to estimate the expected number of failures using the quantile.